Text of a paper given by Guy Hutsebaut at the conference of the Association of European Printing Museums, Making history: collections, collectors and the cultural role of printing museums, Museum of Typography, Chania, (Crete, Greece), 11-14 May 2017. The paper was originally presented in Geneva by Iris Kockelbergh, director of the Plantin-Moretus Museum. It has been adapted for the AEPM conference in Chania by Guy Hutsebaut. My name is Guy Hutsebaut and I take care of the typographical collection of the Plantin-Moretus Museum in Antwerp, Belgium. In addition to that I also take care of the historic monument. First of all I would like to thank the Museum of Typography of Chania for hosting this year’s AEPM event. Furthermore, I wish to congratulate them on receiving the honorary ΕΒΓΕ award for Cultural Contribution this year in april. Before I start, I hope you won’t mind me asking you to bear in mind that the Museum Plantin-Moretus is not only a museum. More accurately, it is an historic house and a monument combined. It was the house and workshop of a family of publishers, a noble family of merchants. I think I should also mention at this point that the house and the archives are listed as Unesco World Heritage. Last year, in 2016, we changed the presentation of the collections and we altered the concept of the historical rooms. I will talk you through the different trajectories we followed, the decisions we made, and why we made them. I will mainly focus on the context of the museum, the old displays of the museum, the preliminary stages of the scenography, the concept of the new presentation, the first evaluation and adjustments. 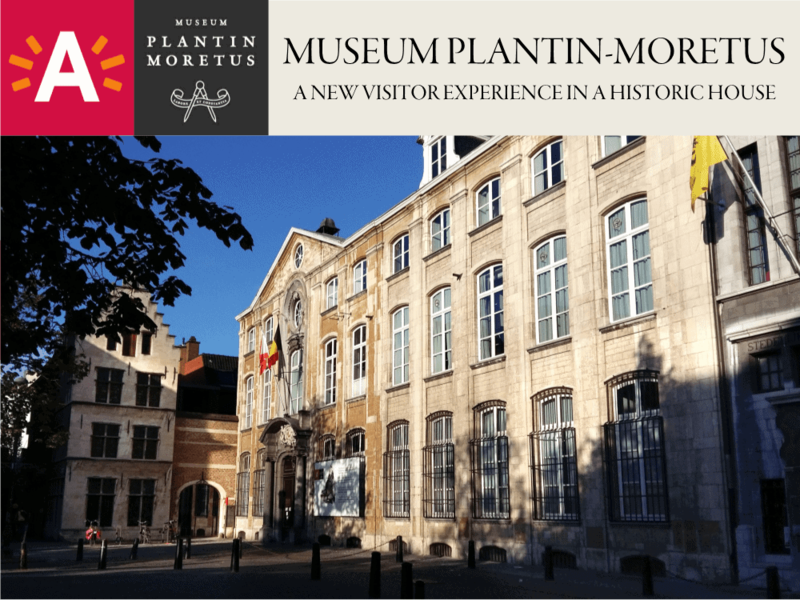 The Plantin Moretus Museum was the home and office of the Plantin and Moretus printing dynasty. The family lived and worked at these premises for an unbroken 300 years. 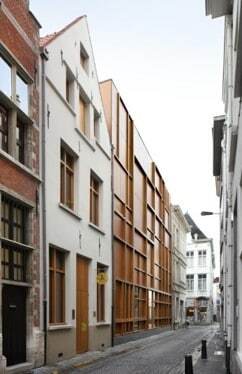 In 1878 the building was sold to the city of Antwerp whereupon it became a museum. The Officina Plantiniana enjoyed world fame. Had the title existed in the second half of the 16th century, Christophe Plantin (1520-1589) would undoubtedly have received the Manager of the Year award several times. The workplace has been preserved in such an impressive way that it feels as if the printers and correctors could come in at any moment and begin their working day. The offices and the shop are still resounding with the echoes of the conversations between Christophe Plantin and the Moretus family and their noble and learned friends, acquaintances and clients from all over the world. 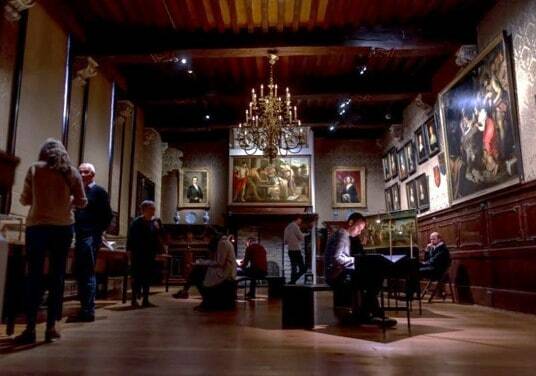 The big drawing rooms breathe Antwerp life of the 16th and 17th century. The museum holds the oldest printing presses in the world. In the type cases a fortune of typographical material has been assembled, among which the original designs for the Garamond type. The libraries house dazzling and unique manuscripts as well as showpieces from European book printing. The archives tell the complete story of three hundred years of activity and the art of living. The Print Room preserves a collection of more than 80.000 drawings and prints of Antwerp artists from 1500 up to the present day and it ranks among the 50 most important print rooms in the world. The house and the printing company have been included in the prestigious list of UNESCO World Heritage. The family and company archives were labeled as unique memory of European history by the UNESCO Memory of the World programme. The building in which the museum is housed is a historic monument which was built mainly during the 16th and the 17th century. It was certainly not constructed as a museum. The premises consist of a series of authentic houses and buildings all connected to each other, with a central, late 16th-century, enclosed garden/courtyard. Several doors open onto the garden and visitors immediately step out into the open air (and vice versa) which results in a large air exchange rate. The museum has central heating but no air ventilation system or central climate-control. As the building is a Unesco monument we are not allowed to install such systems. The single-pane, leaded-glass windows provide only minor protection against outdoor climate conditions. As was common practice in the past, only the lower halves of the windows have shutters, which means that daylight, sunshine and UV-radiation have free access to the rooms. Consequently, we have to keep the shutters closed permanently and the upper halves of the windows are covered with curtains. 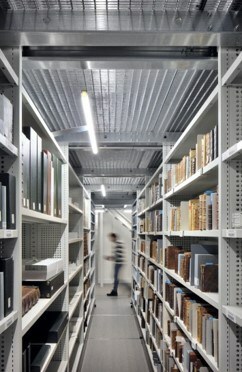 The museum preserves a vulnerable collection of paper heritage. The story of the house is essentially the story of publishing during the 16th and the 17th century, so inevitably an impressive number of books and prints are on display. As paper heritage can only be exposed to light for a limited period of time, we have to change the books on display regularly, but without doing harm to the story we are telling. What did the display look like before the renovation? The former permanent presentation dated back to 1951, little had changed since then. The state of the old presentation forced us to rethink the entire presentation. At the same time we asked ourselves how we could make the displays more accessible for contemporary audiences. The museum is classified as Unesco World Heritage and therefore some people are inclined to say that we should not touch the permanent presentation. Whilst trying to refute this view we took a good look museum’s history. This series of photos taken between 1876 and 1950 shows that the emphasis of the displays has definitely shifted. 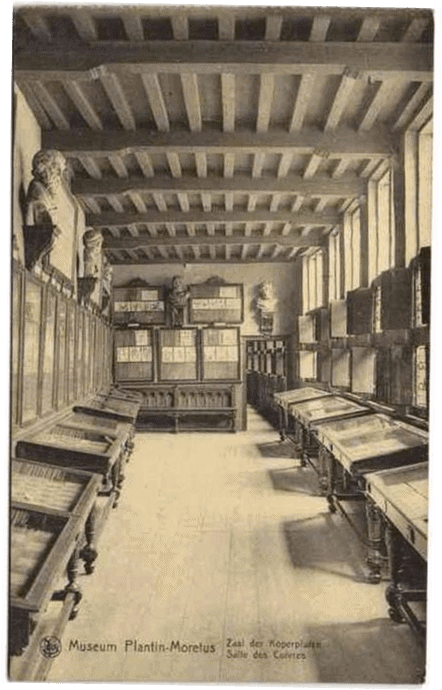 The Plantin-Moretus museum has not always been a museum of books. From the original approach in the 19th and the first half of the 20th century, when greater priority was given to the collection of drawings and prints (related to the rich collection of wood blocks preserved in the museum), a shift occurred as of the 1950s towards a display that told the story of book printing. As part of this shift, work printed by Christophe Plantin and Moretuses, other Antwerp printers, and major European printers was shown. The approach of this display is actually quite characteristic of the 1950s when a purely academic approach was at the order of the day: lots and lots of objects, shown almost taxonomically. In this 1950’s presentation there is no indication of how Plantin and the Moretuses positioned themselves towards other Antwerp printers. There is no information about the distribution and sale of the books and hardly any contextual background or personal approach to the people who lived in this house. New research about the family and the Officina Plantinia that had been revealed in recent decades had no effect on the displays. On entering the museum visitors wandered through the magnificent historical living rooms and workrooms of the Officina on the ground floor. When they reached the first floor they were suddenly confronted with a museum display that focused on books rather than on printing, with no less than 300 books on show! Books in display cases require a great effort from visitors, it can be a very tiring activity. We didn’t offer our visitors moments of rest in between either. Nor were there any eye-catchers in the presentation. The presentation didn’t really engage the visitor. What did the public gain from this abundance of books? How many books did they actually see, were they directed to the core objects in the collections? Indeed, we were posing ourselves the question every museum poses: what is the relevance of our museum, and how can we link it to the world and the interests of our visitors? We decided that we wanted to shift the mere display of books to a presentation of the dissemination of knowledge. The invention of the printing press was a turning point in history. It augmented the dissemination of knowledge in a fundamental way because so many more people now had access to reading, not only the Bible but also such pernicious books as those of Galileo. These new technologies enabled much larger groups of people to participate actively in culture and cultural production. the production of books: who was involved in the production of books, which new techniques were used? the market for books: who bought anatomical books and what did they cost? A variety of visitors were invited to visit the test display: mildly interested people, visitors with a passion for history (our core audience) and teachers (schools). The mildly interested visitor considered the new presentation to be still too high-brow: difficult texts and a complicated story. They prefer a better guided tour, they want to be taken by the hand. They also found that the new presentation lacked innovation and wanted it to be more adventurous. The computers and facsimiles were highly appreciated. The connoisseurs were happy, they liked the entire presentation. Perhaps the texts were a bit too difficult, but they appreciated the amount of information and the different forms of information. The teachers would have liked to see more links between the past and the present. The Unesco recognition is an undeniable sign that on a world scale, the museum occupies a unique position as keeper of precious heritage. It is also a place of pilgrimage for typographers, booklovers and printers from all over the globe. Obviously, visitors are enthusiastic about the museum as it is. Still, there is always room for more experience and less barriers. How can we define what our public really needs? We did have the results from our test display, but to broaden the scope we designed five visitor profiles, based on the theories of Falke & Dierking. The National Maritime Museum in Amsterdam and the Gallo-Roman Museum in Tongeren (Belgium) had already done the same exercise. The profiles helped us to define the needs of different types of visitors and what they expect from us. It also helped us to make choices, create a common thread and then select a limited number of themes. 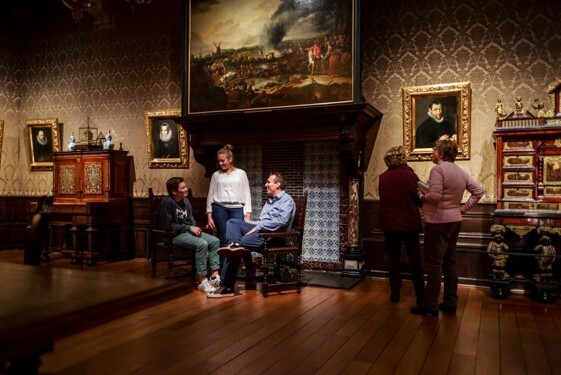 We selected the following visitor types: mixed families, Unesco (city) trippers, non-Dutch speaking newcomers, the creative visitor and the connoisseur. They were sitting with us at the table, so to speak. For each type we created different types of experience levels: from being completely immersed in the ambience and lifestyle of the Plantin-Moretus family during the 16th and 17th centuries, to witnessing how living and working went hand in hand, getting acquainted with the different steps of the printing process, losing yourself in the beauty of a single book or grasping the complexity of publishing books in a world in transition. 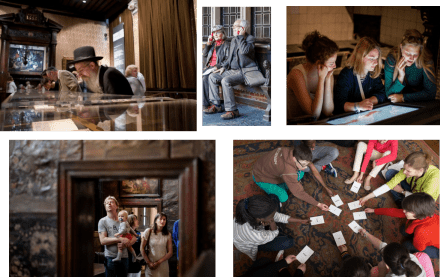 Over the years the museum has developed elaborate programmes for schools and it can also rely on a lot of experience with the specific challenge of attracting less responsive visitor groups, this in collaboration with local cultural partners. With the aim of telling a more accessible museum story, these programmes focus on emotion and experience. The same approach has now been applied to the new design of the permanent exhibition. We intensify the ambience of the house, the liveliness of the living quarters and the hustle and bustle of the workplace. Experience and participation are important factors when you want to appeal to a broad contemporary audience. Through repopulating the rooms with people who actually lived and worked (different age groups, origin, gender) at the premises so long ago, a significantly larger part of the audience (families with children, less highly-educated visitors, ….) will be able to identify with the rich history of the house and also feel more involved. We asked a theatre dramaturge to have a proper look at the building: how do people actually move through the rooms? Where does the routing falter? How do we construct a trajectory where visitors are gently guided to the highlights, where do we need to have rest areas? The dramaturge suggested to make Plantin the central figure of the story and introduce visitors to Plantin as family man, CEO of an international publishing company, employer, manager, humanist, printer, visionary editor and disseminator of knowledge during the 16th century. In other words: on the ground floor visitors should be submerged in some fascinating stories through which they get to know Plantin in all his different capacities. The first floor then is something completely different: here the story of book publishing is told, in four different zones each devoted to a different theme. The zones are separated by historical rooms which can not be moved. As a matter of fact, the house always was and still is the principal narrative element in the story. It is the background for the entire tale. Visitors meet Christophe Plantin and are introduced to his family and his friends. They are immersed in the printing process and walk in the footsteps of the world class entrepreneur who built his company and made his dream come true. By giving the house back to its inhabitants and the many different people who worked in it we are allowing more people to identify themselves with the rich history of this house. We create a visit which absorbs the visitors, allows them to live the life of the house and go home with a proud feeling. Total experience, think-feel-do: everything has to combine and balance these parameters. Accessibility, does an interested, but not specialized visitor understand the story as well? Clarity, is the display not too aesthetic or estranging, not too difficult? Authenticity, does the presentation add to the reputation of the general and all-encompassing story of the Plantin Moretus Museum? Oh my!, does this fascinate the curious visitor and the visitor who wants to share his passion? Does it add to a unique experience, an unforgettable experience? Shareable, can a visitor live through this experience with others and also share it (physically or virtually)? Memory, does it add something to the visitor’s lasting memory? Or make him want to talk about it with others? Based on all the information we gathered we started to look for scenographers and a lighting specialist. The architects we selected were very much aware of the authenticity of the historical building as well as durability and the relevance of a UNESCO site. The interior design they came up with is meant to arise out of the books and the house itself. To understand what they mean, you only have to look at the 17th-century paintings by Pieter De Hoogh (1629-1684). The architects wanted the experience of space and the narrative of the Plantin-Moretus house to have the same sensitivity as the De Hoogh paintings. The approach to the interior design had to bear a similar poetic and tangible approach. In this context, light is something palpable, something that can catch a gesture. It illuminates a book, but also the hand that leafs through it. A design that is consistently tuned in with the ritual of handling book, reading, and leafing through books runs like a thread through the entire visit. A feeling that also comes to the surface in the video-installations which highlight the different encounters with Plantin. The historical house is now a warm and welcoming home. Visitors are encouraged to sit in the chairs near the fireplace or at the table to read in a book. Volunteers greet the visitors and familiarize them with the house. Volunteer printers demonstrate old printing techniques. Ambience and emotion. To hear, to see and to feel. Soundscapes bring the site alive: the hustle and bustle of the workshop, family life, the customers and the printing process. Feel at home, take a seat beside the fireplace or step behind the counter in the shop, take some time to meditate in the bedroom, leaf through the pages of the books that have been left behind. We want the individual visitor to leave the museum with a knowledge of who Plantin was, how he contributed to the history of Europe and why the house with its exceptional collections was preserved. It begins right at the entrance. We had noticed that visitors were sometimes pondering whether to enter the building or not. Now there are two gigantic screens literally urging visitors to come in. Once they are inside, Plantin greets them. The encounters with Plantin the familyman, the manager, the employer, the humanist and printer are illustrated with short atmospheric films. For visitors who do not make it to the first floor because they have limited mobility or they don’t have the spare time, a tour of the ground floor must tell a complete story about who Plantin was and what his inheritance entailed. The ground floor is a kind of time capsule which transports you to the 16th Century. Lighting effects and dramaturgy are of the essence in the historical rooms. The first floor is an intensification of the story of visionary publisher Christophe Plantin and how he managed to shape entrepeneurship and publishing in the 16th century. 10 masterpieces relate how Plantin helped to shape the history of Europe. We are giving our visitors a hand when they are trying to find their way in the maze of 34 rooms filled with objects and stories. We have made clear-cut choices: the main story line is told in the gallery texts, the extra information has been compiled in the visitor guide. The highlights of the museum are emphasized more markedly. Ten masterpieces form the core of the book display, they are our heroes, the books with which Plantin helped to shape the history of Europe. They are completed with human interest histories. The masterpieces are easily recognizable through the red text panels on which they are presented. This is a house full of books. However, by establishing the link with the private world of the visitor we will also make the exhibits attractive for non-booklovers. We have opened up the display on the first floor for non-booklovers. We introduce Plantin in four modern themes: man and society, dissemination of knowledge, religion/spirituality and language. Extra consideration is given to recognizable items such as the power of mass media, Plantin the migrant and daily life. Each theme is accompanied by an interview which reflects a present-day view on the matter. We want visitors to recognize themselves in the new presentations. Therefore we tell stories that are easily identifiable. For the international visitor: stories about Plantin’s friends and acquaintances from all over Europe: French, German, Hungarian, Spanish, Italian. For young adults: the study scheme of Balthasar I Moretus in Leuven, the study of hieroglyphs. City law enforcement on: riotous youngsters, ice skating on the city canals, marriages of convenience, copper thieves. Different writing systems: Hebrew, Arabic, Syriac, Aramiac, Ethiopian (referring to the countries of origin of contemporary refugees who we work with). We are extremely proud about the successful symbiosis of design and contemporary techniques. This museum is breathing with books: a smart visitor guide which emphasizes the ritual of reading throughout the entire display, facsimile books, reading tables with appropriate reading light, gallery texts printed on book linen. Experience is developed throughout the museum using soundscapes, poetical videos and installations. The story of books is disclosed and enriched with the most recent techniques: a 3D-audio play is available via smartphone, and the entire site has been modeled in a 3D-print, just like old type. A digital animation on book printing relates the story of Gutenberg up to Steve Jobs and in the digital library visitors can vote their favourite book into the top 10. Belgium has three official languages: Dutch, French and German. The language laws of the country imply that we have to provide all the texts in these languages, with English as an additional international language. The length of the different kinds of text has therefore been strictly determined. We used the advice of the V&A in London on the matter. The museum now has brand-new hands on room. Young and old can try out the different technical steps of the printing process. Hands on: feel materials and leaf through books. 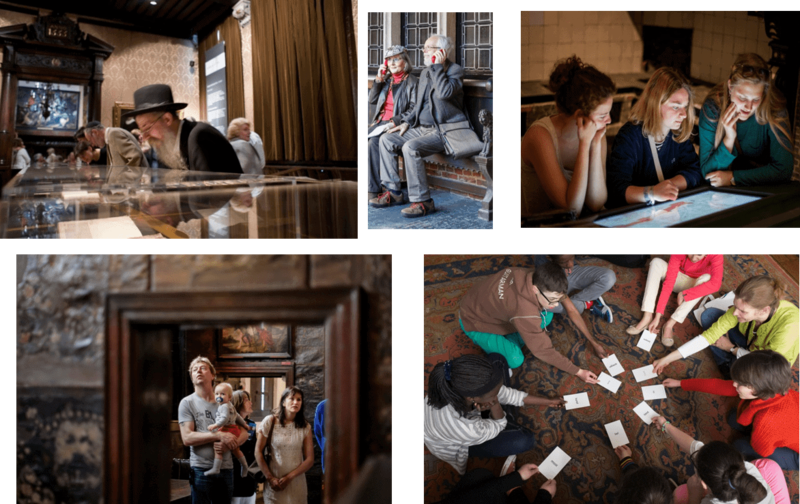 Hands on: do so wearing clothes from the era of the Plantin & Moretus families. Hands on: sit at the table. Interactive: play a game with your family. Interactive: negotiate about the production of your latest book. Interactive: share your experiences on social media. In the 16th century Plantin created a hub on Vrijdagmarkt, where scientists could meet and from where knowledge was spread. He contributed to the shaping of Antwerp as a creative place for the development of book printing and a completely new way of making images through the use of graphical techniques. Today, young designers are given the opportunity to fit out the museum shop for a number of months and develop products for the shop. Every two years a professional typographer will present his own interpretation of the old typographical material. We are closely collaborating with contemporary professionals in the vicinity of the same Vrijdagmarkt. The square was the centre for book printing in the 16th century, and today it is a hotspot of creative industry. We are initiating collaboration with students and artists and we stimulate them to use heritage as a source of inspiration. In 2017 the museum will carry out an in-depth evaluation of the new presentation. This evaluation will call upon visitors, external collaborators and stakeholders. We have already conducted an evaluation among the exhibitions team. Generally speaking the museum staff are quite satisfied with the new displays. After all, they have been receiving very positive feedback from the visitors which of course enhances the general feeling of satisfaction. The collection is now preserved and displayed in much better conditions. The new display has been adjusted to the demands of contemporary visitors. The information is relevant for contemporary visitors. The story line is coherent and there is a fine balance between primary and secondary information. 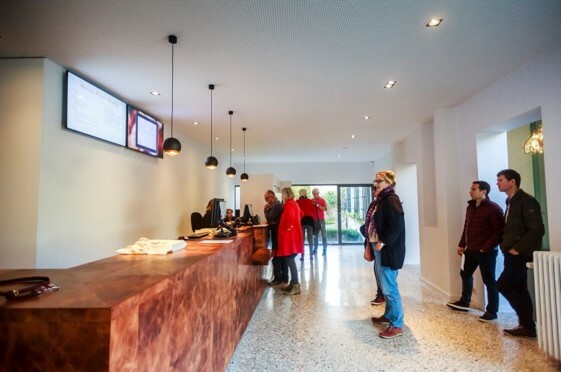 Ambience and emotional experience result in an intensified visitor experience. 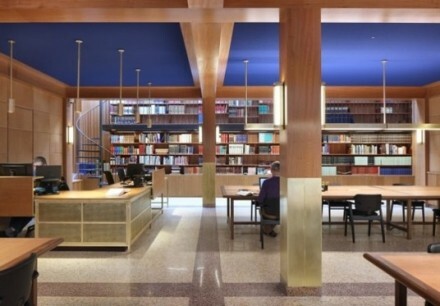 The important role of the printing office, of Antwerp as a centre for printing in the development of dissemination of knowledge in Europe is made understandable for a wide audience. 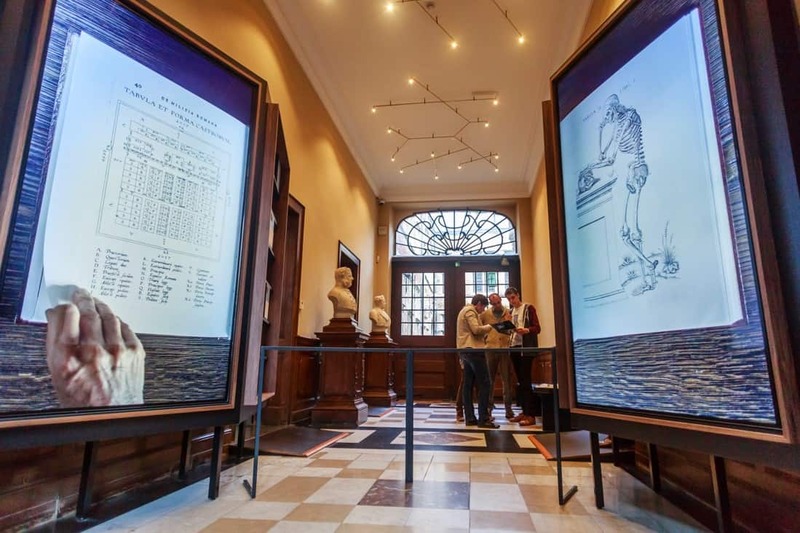 Lighting, interior decoration of the historical rooms and the thematic exhibition ‘Plantin as publisher’ are a success. The larger part of the staff members agree that the museum is now adjusted to the five preset target groups; however, a number of things should be added, especially for families and creative persons with a passion for typography. The educational room scores high in the general evaluation, just like the hands-on activities in the display. They also need slight corrections however. Encounters with Plantin through video and animation: not every visitor agrees with the concept. The first encounter is rather difficult to figure out. The information which is given on the ground floor needs working on. It is not yet completely satisfactory. Especially the history of the house and life in the house throughout its history are under-exposed. An extra audio tour could be the right answer. The soundscapes do not yet function a 100%. The audio play on the app is receiving mixed appreciation. The routing of the visit is not always clearly indicated, especially in the inner courtyard. The quick tour with map is a bit too complicated. The borrowing system for the visitor guide isn’t completely working like it should. PS. I will certainly return with my grandchild! Opening weekend: I visited your museum on Saturday and Sunday. What a privilege to see all this history! Very interesting. Carry on! Familie Beltman, Den Haag, Nederland. An outstanding aesthetic, even fairytale like experience. Communicative and educational. R. De Smet 25.10.2016. Amazing! We came from Chili without any expectations and now we’re going home completely astonished. How much history in one of our most beloved activities: print. Best regards and congrats from a linguist and a historian. Claudia and Eduardo. Thank you for preserving the history of this house and Plantin & his family and their printing press. Very informative. Kyra & Rylan from Mata, Europe. 20th November 2016. Thank you very much for your attention, Efgaristo poli.